In recent decades the notion of “invasive plants” gained momentum. This article tries to answer the question why there seems to be such a strong interest to create a myth of plant-invaded gardens and landscapes and to manufacture demons of invasive species. It refers to the interest in plants, gardens and landscapes in early human history and focusses upon the development after Humboldt’s and Bonpland’s Essai sur la Géographie des Plantes (1805) and Haeckel’s Generelle Morphologie der Organismen (1866). Examples from German and American sources indicate that what began as an internationally oriented science in early 19th century deteriorated into increasingly reactionary nationalist oriented tinkering with the results of scholarly studies. In early 21st century those who doctrinarily plea for “native” plants often also condemn “foreign” or “exotic” plants as aggressive intruders. They suggest that native plants are peaceful and non-invasive and thus give evidence of their biased viewpoint. Au cours des dernières décennies, la notion de « plantes envahissantes » s’est de plus en plus imposée. Cet article tente de comprendre pourquoi on cherche tant à créer un mythe de jardins et de paysages envahis par les plantes, lesquelles prennent la figure de démons. Les auteurs puisent leurs références dans l’histoire ancienne des plantes, des jardins et des paysages, et s’intéressent tout particulièrement aux développements qui sont intervenus après la publication de l’ouvrage Essai sur la Géographie des Plantes de Humboldt et Bonpland (1805) et de l’ouvrage Generelle Morphologie der Organismen de Haeckel (1866). Des exemples empruntés à des sources allemandes et américaines montrent que ce qui était une science reconnue de façon internationale au début du XIXe siècle est progressivement devenu une science nationaliste et réactionnaire allant jusqu’à manipuler les résultats des enquêtes académiques. Au début du XXIe siècle, ceux qui plaident en faveur des espèces « indigènes » sont ceux qui, dans le même temps, considèrent les plantes « étrangères » ou « exotiques » comme « intrusives ». Pour eux, les plantes indigènes sont pacifiques et non envahissantes. Ce qui prouve combien leur point de vue est biaisé. 1In recent decades, probably beginning after World War II, the notion of “invasive plants” gained momentum. However, much of the myth of plant-invaded gardens, parks, and even landscapes is a phenomenon of the late 20th and early 21st centuries. In terms of the existence of the earth this appears to be a fairly short period. So let us put this in frame. Is there any evidence that plants aquired invasiveness? Were they sent to kindergarten, school, college and university where they learned how to become invasive? Who were their teachers? Which books were they encouraged to read? Is it likely that plants were non-invasive before, say 1900, and then developed strategies for invasion? 2Did the plant realm agree to have a ministry of defense or a subscription office for plants? Is there an army of plants whose generals develop strategies for the invasion of foreign territories? Did geneticists discover an invasive gene in plants? 4In the course of world history plants came into existence long ago. They grew in certain locations, became extinct or grew again somewhat modified in new locations. If one were to look at plant distribution about 100,000 years ago, or even 1 million years ago would anybody expect the same distribution today? The historic glaciation of the earth seems common knowledge. How would one describe the reclamation of deglaciated land by plants? Would these plants in early 21st century ecologist language be called “invasive”? Would they have invaded a landscape where nobody even thought about landscape? Why should this be so? 5Of the many 100,000 of years of the existence of the earth the last 200 years or so have seen a human interest to learn about the distribution of plants. Closer observation within the last century revealed that even plants are not as static as some would have it. Gardens and landscapes seem to be fairly recent elements of civilization, alas, even these territories are seen to be invaded by plants or “aliens” disguised as plants. These alien plants are seen “as rootless as the humans who invited them in.” [Leland 2005: 170] As humans most of us are probably happy to have no roots. As elsewhere so with plants “panta rhei. “ Why then has it become of interest to talk about plants that invade gardens and landscapes? We do not have a definite answer but will try to indicate why this may be so, from a German perspective, at least. Except some acacias and the doum palm all other trees there have been introduced or did gain meaning for the image of the landscape through human intervention only. This holds true in the first instance for the date palm, the characteristic tree of the oasis landscapes of Northern Africa and Asia Minor. By cultivation it became the main tree of Egypt [Rikli and Rubel 1928: s.p.]. 7Several thousand miles north of Egypt in the Assyrian city of Ninive the king arranged his gardens like the Amanus mountains and had every tree of the Hatty land planted in them [Haas 1982]. By Juno, a beautiful retreat! Here the platan spreads very widely its cooling boughs, and is superbly tall. The twilight beneath the low willows – how refreshing it is! – and the whole air is filled with their pleasant fragrance – a cheerful fountain of coolest water flows beneath the platan, which appears to be sacred to certain nymphs, from the statues of virgins that adorn it. Then, again, notice what a summer-like and agreeable singing resounds from the choir of katydids. But the sweetest sight of all is that of the grass so persuasively adapting itself to receive on its sloping velvet the reclining head [North 1858: 302]. I’m a lover of learning, and trees and open country won’t teach me anything, whereas men in the town do [Hackforth 1972: 25]. 10As the Romans went to Egypt and occupied the territory for almost 700 years, from 58 BCE to 620, and to Greece, from 146 BCE to 330, they learned from the local garden cultures in these countries and brought some of that knowledge into their gardens in Rome and vicinity. An outstanding example is the villa of the Roman emperor Hadrian near Tivoli which was built from 118 to 134. It included “landscapes” from Egypt and Greece [Kahn 1995]. Is this sign of civilization an example of an “invasive” landscape? Biased as this Eurocentric view may be there will most certainly be comparable results for early human history plant and garden culture if one were to address these issues for the Asian world, especially for China, Japan, Korea, India, and Indonesia. Human interest in plant cultivation is an early sign of civilization. 11In Europe this interest became more focused as science developed in the course of the 19th century. Two names must suffice, Alexander von Humboldt (1769-1859), and Charles Darwin (1809-1882). In his Essai sur la géographie des plantes which he published together with Aimé Bonpland (1778-1859) in Paris in 1805 Alexander von Humboldt showed a cross section of the slopes at the Chimborazo volcano in Equador in which he grouped the plants and also marked borderlines for plant growth [Humboldt et Bonpland 1805]. Humboldt’s research proved that plant growth depended upon geographical conditions and his method became widely applied for plant research abroad and in Europe [Engler 1899]. Darwin, the founder of modern botany, published his seminal work On the Origin of Species in London just 150 years ago , the year when Humboldt and Bonpland died. This rising interest in the knowledge of plant distribution is reflected in a colored lithograph “Gemälde der organischen Natur in ihrer Verbreitung auf der Erde” (Painting of Organic Nature in its Distribution on Earth) by Joseph Päringer, based on original work by Ferdinand August Maria Franz von Ritgen (1787-1867), a professor of medicine at Giessen University, and Johann Bernhard Wilbrand (1779-1846), director of the Botanic Garden at Giessen, which was published in Giessen in the year 1821 by C.G. Müller. The painting was dedicated to Johann Wolfgang von Goethe (1749-1832), Alexander von Humboldt and anatomist as well as anthropologist Johann Friedrich Blumenbach (1752-1840), whose lectures had been attended by Humboldt. 12In 1822, one year after “Painting of Organic Nature in its Distribution on Earth” had been published, the Association for the Promotion of Horticulture in the Royal Prussian States (Verein zur Beförderung des Gartenbaues in den Königlich-Preußischen Staaten) was licensed by the Prussian king Friedrich Wilhelm III [Gröning 1989]. 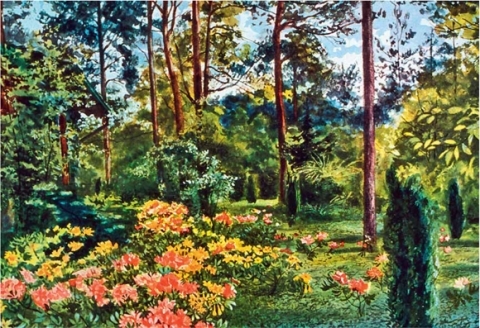 The goal of this association was “the promotion of horticulture in the Prussian state, the cultivation of fruit-trees in all its branches, the growth of vegetable and commercial herbs, the cultivation of ornamental plants, of plant forcing, and of visual garden art.” The interest in visual garden art may be seen as a basis for the development of professional activities in this field a part of which included attempts to select plants on a scholarly basis [Fintelmann 1841]. 13In 1851 for the first time in Germany a plant geographical compartment was laid out in the Botanical Garden of Breslau University [Engler 1886]. The fourteen plant geographical areas represented all continents but not a single flora from Germany. In 1889 the director of the Breslau Botanical Garden changed position to the Botanical Garden at Berlin-Schöneberg. There he enlarged the already existing plant geographical compartment for the northern moderate zone. In the “Northern and Middle-Europe” area a heath landscape was displayed for the first time. In correspondence to the other “landscapes” it was arranged according to geographical sequence in Middle Europe. Is this another example for “invasive” landscapes? 14The growing interest to understand plant growth led Ernst Haeckel (1834-1919), a professor of comparative anatomy at Jena University who met Darwin several times and who popularized Darwin’s writings [Staufer 1957] to introduce the notion of ecology [Haeckel 1866a] into science. In his book Generelle Morphologie der Organismen. Allgemeine Grundzüge der organischen Formen-Wissenschaft, mechanisch begründet durch die von Charles Darwin reformierte Descendenz-Theorie (General Morphology of Organisms. General Basics of Organic Form-Science, Mechanically Established by the Reformed Descendence-Theory of Charles Darwin) which was published in 1866 in Berlin, he tried to determine “the character of the plant realm” in chemical, morphological and physiological respects. To respectably represent the native flora is the task of the botanical gardens; for botanical studies are rooted unshakenly in native flora [... ] Naturally German flora is favored [1894: 25]. 18Drude also believed in the vocation of botanical gardens to support garden art. This claim could be matched when the “Königliche Gärtnerlehranstalt,” the highest-ranking horticultural school in the German Empire was reopened together with a new botanical garden in 1903 in Berlin-Dahlem [Echtermeyer ed. 1913]. It was my highly respected teacher [... ] Engler who assigned me to a rewarding task, the description of a native formation based on thorough studies in nature [... ] The area encompasses the provinces of Hannover, Saxony, Brandenburg, Schleswig-Holstein, Posen, Pommerania, West- and East Prussia, as well as the duchies of Oldenburg and Mecklenburg [ibid. : 500-501; our translation]. 20This is another example how to manufacture a garden which then may be seen as needing to become defended against “invading” species. Those flowers that have been usually planted in former times in Gardens of this Kingdom [... ] have by time and custome attained the name of English flowers, although the most of them were never natural of this our Land, but brought in from other countries at one time or other, by those that tooke pleasure in them where they first saw them [1629: 11]. 23Lange’s “biological aesthetic” was modern in the sense that it applied science to design. However, from a social perspective it was reactionary. It promoted dubious ideas about the assumed relationship between the German people and nature. Additionally within particular groups of society it provoked hostility towards the “international” by the exclusion of foreign plants. Lange instrumentalized the emerging field of ecology and the idea of natural plant associations for his naturalistic trend in garden design. In 1895 the Danish Eugenius Warming (1841-1924) published the book Plantesamfund, grund traek afden oekologiske plantegeografi . This may have marked a starting point for ecology as “a definite science” as Rehmann remarked much later [1933: 239]. Warming’s book was subsequently translated into German as Lehrbuch der ökologischen Pflanzengeographie  and into English as Ecology of Plants: An Introduction to the Study of Plant Communities . In the United States of America Henry Chandler Cowles (1869-1939) [Cassidy 2007] from the University of Chicago became so fascinated with Warming’s book that he learned Danish in order to be able to read the book in its original language. Cowles read German also. In 1898 he handed in his PhD thesis “The Ecological Relations of the Vegetation on the Sand Dunes of Lake Michigan” which subsequently became published in 1899 in the journal Botanical Gazette [Cowles 1899]. Nowadays Cowles is known as the first professional American ecologist. Every natural aggregation of plants is the product of definite conditions, present and past, and can exist only when these conditions are given. The whole structure of plant sociology rests upon this idea of sociological determination [1983: VIII]. [Sociology and plant sociology] have one important point of contact: they are concerned not with the expression of life of the individual organism as such but with groups or communities of organisms having more or less equivalent reactions, bound together in mutual dependence [1983: 1]. 26So here another element of the manufaction of a garden or a landscape emerges. The invention of a plant community and even a plant association. As if this were not enough an additional category of determination is introduced. Thus alluding that determination helps against invasion. Plants, like ourselves, group together and have their likes and dislikes . 28For the German landscape architect Willy Lange, a “nature garden” would have an informal rather than geometric or architectural design (Figures 1 and 2 on pages 198 and 199). 29Native plants would be preferred to foreign ones. Moreover, the garden had to be subordinated to the surrounding landscape. 30This evokes the idea of a fortification where in case of an attack of an invader the gardens come to rescue the landscape. Lange considered the centuries-old art of topiary as evidence of human hegemony over nature – cutting trees, shrubs, and hedges was a form of anthropocentric dominance over nature, and an expression of the unnatural attitudes of other cultures. Instead, humans should follow and augment the so-called laws of nature spiritually, arranging nature artistically in the form of the “nature garden.” Given a “landscape” would become “invaded” we now learn that “nature gardens” only provide good troops for the defense of a landscape. Let us find the national style for our gardens, then we will have art, German garden art. As long as different nations exist, there must exist different national styles [1900: 364; our translation]. 32By ressorting to “national” gardens and landscapes as opposed to “international” ones another barrier becomes erected which seemingly allows to refute invasive intentions of plants. Our feelings for our homeland should be rooted in the character of domestic landscapes; therefore it is German nature that must provide all ideas for the design of gardens. They can be heightened by artistic means, but we must not give up the German physiognomy. Thus, our gardens become German if the ideas for the design are German, especially if they are borrowed from the landscape in which the garden is situated [1907: 358; our translation]. 34Such a view was not only popular during the Imperial Reich in Germany but continued through the Weimar Republic and became part of the state doctrine during National Socialism. 36Later when Seifert became one of the leading landscape architects of National Socialism, he elaborated upon this struggle, as “a fight between two opposing Weltanschauungen: on one side the striving for supranationality, for levelling down of huge areas, and on the other the elaboration of the peculiarities of small living spaces, emphasizing that which is rooted in the soil.” [Seifert 1930a: 162; our translation] Seifert echoed Lange, who some years earlier had praised the “rediscovery of so-called folk art; the stressing of one’s own folk character – in opposition to the glorification of the international, in reality nonnational.” [Lange 1928: 18; our translation] Rootedness to the soil is far from mobility, another essential precondition for invasion. [The Germans] still lack gardens that are race-specific, that have their origins in nationality and landscape, in blood and soil. Only our knowledge of the laws of the blood, and the spiritually inherited property, and our knowledge of the conditions of the home soil and its plant world (plant sociology) enable and oblige us to design blood-and-soil-rooted gardens [1936: 43; our translation]. As with the fight against Bolshevism, our entire occidental culture is at stake, so with the fight against this Mongolian invader, an essential element of this culture, namely, the beauty of our home forest [is at stake] [Gröning and Wolschke-Bulmahn 1992: 124]. 39The closeness of the interest to eliminate foreign plants to the interest of the National Socialist German Reich to eliminate Jews and other people considered subhumans is striking. More so, in this example plants become nationalized as “Mongolian” which must be seen as part of the interest to support the myth of plant-invaded gardens and landscapes. 40In late 20th and early 21st centuries landscape architects have tended to avoid the use of plants that are believed to be “exotic” or “non-native.” Many professionals and lay people who are interested in nature, landscape, and gardens assume that what they believe are so-called indigenous or native plants are unquestionably better than those declared non-native or exotic. 41Reinhard Witt, a German biologist and advocate of “nature gardens,” published an article entitled “Tear the Rhododendrons out.”  Witt demanded the liberation of gardens in Germany from foreign trees and shrubs, especially rhododendrons. The “troops of the invaders” had begun to suppress the interests of the local association respectively population, i.e. vegetation. A few years later Leslie Sauer from the United States felt that only the North wood areas of Central Park in New York were “healthy” since they were without exotic plants. Other places in Central Park without native plants Sauer rated as “degraded areas.” [1993: 56] This hostility towards foreign plants appears to be a phenomenon in many countries around the world. This notion encompasses a remarkable mixture of sound biology, invalid ideas, false extensions, ethical implications, and political usages both intended and unanticipated [1997: 11] [...] Natives are only those organisms that first happened to gain and keep a footing [... ] In this context, the only conceivable rationale for the moral or practical superiority of “natives” (read first-comers) must lie in a romanticized notion that old inhabitants learn to live in ecological harmony with surroundings, while later interlopers tend to be exploiters. But this notion, however popular among “new agers,” must be dismissed as romantic drivel [ibid. : 17]. 43Those who doctrinarily plea for “native plants” often also condemn “foreign” or “exotic” plants as aggressive intruders, thus suggesting that native plants are peaceful and non-invasive. Numerous publications give evidence of this biased viewpoint. In an article “Wildflowers: The Case for Native Plants,” for example, it is stated that some non-native naturalized wildflower species in the United States exhibit “aggressive, weedy behavior.” [Diboll 1989: 2] Characterizations such as “invasive exotic weeds,” “non-indigenous invasive weeds,” “exotic species invasions,” and “foreign invaders” are common in relevant publications. 44Advocates of native-plant use tend to ascribe high moral qualities to themselves and to their followers. An essential part of this realm of moral qualities is the idea of the nation. This idea developed in the Western world in the course of the 19th and 20th centuries at the same time as disciplines such as plant geography, plant ecology, and plant sociology were being established. 46With regard to the actual design of parks and gardens in Germany, such public pressure was not predominant, but it can be seen as an aspect of a reactionary national ideology which was going to dominate German society. 47Similar trends might be seen in other industrial countries in the late 19th and early 20th centuries, at the high point of imperialism. In England, for instance, William Robinson and others searched for the truly English garden. In France André Vera was looking for the truly French garden. In the United States, as we will see later, Jens Jensen, Wilhelm Miller and Frank E. Waugh tried to pull away from the garden design of the Old World and wanted to establish a genuinely American garden style clearly distinguished from the European. Only in Germany, however, this interest became part of a radical nationalistic movement which emerged in early 20th century. It was enforced when in January 1933 the National Socialist German Workers’ Party (NSDAP) came to power in Germany. Then nationalism, hate and dislike of anything foreign and un-German, which had been common in fractions of the society in Germany ever since, turned into a powerful public movement. It helped to promote the myth of plant-invaded gardens and landscapes. Today we have a natural science that is based on the history of development. It teaches us, as far as the interrelations between creatures with their homeland and their fellow creatures are concerned, to understand the laws of life. Biology penetrates all previous knowledge, which was only superficial. Biology, applied to art, establishes a new, a biological aesthetic [1913: 29; our translation]. 50As noted above, the concern for a “national” style of garden which emerged in Germany was also evident among some US landscape architects. 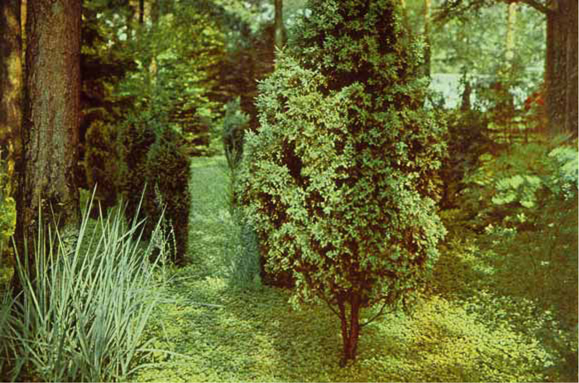 They felt they should prefer native plants in their early 20th century American garden and landscape designs. Some even believed in the exclusive use of native plants. Such claims in the United States were made most emphatically by Jens Jensen, Wilhelm Miller, and Frank A. Waugh. Here we will discuss Miller and Jensen only. The prairie style of landscape gardening is an American mode of design based upon the practical needs of the middle-western people and characterized by preservation of typical western scenery, by restoration of local color, and by repetition of the horizontal line of land or sky which is the strongest feature of prairie scenery [1915: 5]. [Ecology was] a new and fascinating branch of botany that deals with plant societies [ibid. : 18]. 53Thus not only science and history were incorporated into garden design, but also the sense of a region – the Midwest, not in fact a particularly well-defined geographical area, but certainly a large region relative to the size of some European states. With his proposal for a regional garden style for the Midwest, Miller reacted against the garden design which had become popular among wealthy garden owners in the North Eastern Atlantic Seaboard in the United States and which he feared would become the prevailing style. He complained, for instance, about “great excesses of artificiality, especially in the East, where rich men’s gardens are often loaded with globes, cones, pyramids, cubes, and columns of evergreen foliage.” [1915: 32] Miller wanted the design of gardens correspond to what he believed were the more modest means of the Midwest. This was along the lines of the subordination of the garden to the surrounding landscape, a landscape which would be able to defend itself against plant-invaders. Perhaps it may be too restricted to design a landscape picture only by the means of simple indigenous plants. But please consider that it was them amongst whom we grew up, that they taught us a particular language, without interruption since the earliest days of our tribe, that they are interwoven with the soul of our race and, indeed, no art of landscape gardening will be called true art and will be able to reflect the soul of a tribal people, if it does not take its means of expression from the environment of these people [1923: 68; our translation]. 55Here Jensen evoked the idea of a mutual interest between humans and plants to go together to kindergarten and school and learn from each other. Art must come from within, and the only source from which the art of landscaping can come is our native landscape. It cannot be imported from foreign shores and be our own [Jensen 1990: 63]. No plant is more refined than that which belongs. There is no comparison between native plants and those imported from foreign shores which are, and shall always remain so, novelties [1990: 4041]. 58The strong conservatism inherent in Jensen’s wish that foreign plants shall always remain so serves the interest to manufacture a permanent threat of invasive activities of such plants. The fact that Jensen himself was born in Denmark and had lived there for more than twenty years before he “invaded” the United States of America, yet could presume to develop the American “Prairie Style,” might cast some doubt on the idea of any congenital relationship of humans to particular landscapes. 60Jensen’s idea of the garden as a stranger in its own land can be read as the garden as an invader of the landscape. The garden is a fine barometer by which to judge the intellect of a people. If the garden which is a true expression of the life of a people will not consist of horticultural specimens, rather of a simple arrangement of plants in a harmonious whole – that is art. The other is science or decoration. It takes a higher intellect to create a garden out of a few plants than of many [1940-1941: 17-18]. The landscape is always a form, an expression and a characteristic of the people [Volk] living within it. It can be gentle countenance of its spirit and soul, just as it can be the grimace of its soullessness [Ungeist] and of human and spiritual depravity. In any case, it is the infallible, distinctive mark of what a people feels, thinks, creates, and acts. It shows, with inexorable severity, whether a people is constructive and a part of the divine creative power or whether destructive forces must be ascribed to it [1942: 13; our translation]. The gardens that I created myself shall [... ] be in harmony with their landscape environment and the racial characteristics of its inhabitants. They shall express the spirit of America and therefore shall be free of foreign character as far as possible [...] The Latin and the Oriental crept and creeps more and more over our land, coming from the South, which is settled by Latin people, and also from other centers of mixed masses of immigrants. The Germanic character of our race, of our cities and settlements was overgrown by foreign character. Latin spirit has spoiled a lot and still spoils things every day [1937: 177; our translation]. Such ideas about the alleged negative influence of so-called “Latin people” were clearly in line with the National Socialist agenda. But Jensen was forced to step back from further expression of his racist ideas by correspondence from Harold LeClaire Ickes (1874-1952), the American Secretary of the Interior from 1933 until 1946, who had learned about Jensen’s leanings toward anti-Semitism [Ickes 1941]. In any way Jensen brought forth another category for the myth of plant-invaded gardens and landscapes as he suggested to differentiate between Latin and Germanic race characters. This may lead to speculate if plants of supposed Germanic origin are entitled to invasion whereas plants of Latin origin are not. Rhododendrons in the gas chambers! Kristallnacht against Kudzu! Gert Gröning and Joachim Wolschke-Bulmahn attempt to link native-plant advocates with Nazism [Sorvig 1993: 194]. Several times in the past few years I have been brought up short by the suggestion that ecological restoration is a form of nativism – the ecological version of the sort of racist policies espoused by the Nazis or the Ku Klux Klan. Like the Nazis and the Klan, restorationists espouse the exclusion and removal of immigrants, and even a program to ensure genetic purity of stock in order to protect the integrity of the native, the true-born, the Blut und Boden. Hence restoration offers a disturbing resemblance in the ecological sphere to policies of nativism, racism, and sexism in the social sphere – so the argument goes [1994: 113-114]. 66If there is a future to garden culture and garden design then new ideas, new concepts for gardens, new plants, and new materials are essential. The history of garden culture provides ample evidence for the multitude of connections between people, politics, design, and plants. Militant calls such as “foreigners out,” or more specifically, “Tear the Rhododendrons out,” seem not particularly well-considered solutions to what are called ecological problems. Such calls transmit reactionary ideas about nature, the design of gardens, parks, and other open spaces as well as about society. Rather a scholarly discussion about plants, trees, shrubs, their value and their significance for design should develop, and for that a look into history may be helpful. There is no need to glorify historical events. Professional development could profit from critical analyses of the works and the ideas of predecessors in biology, botany, garden and landscape design. Certainly there is no need for plant-invasion related mythology. If this kind of garden-owning barbarian became the rule, then neither a gillyflower nor a rosemary, neither a peach-tree nor a myrtle sampling nor a tea-rose would ever have crossed the Alps. Gardens connect people, time and latitudes. If these barbarians ruled, the great historic process of acclimatization would never have begun and today we would horticulturally still subsist on acorns [... ] The garden of humanity is a huge democracy. It is not the only democracy which such clumsy advocates threaten to dehumanize [1987: 240; our translation]. 68In the course of world history plants came into existence long ago. They grew in certain locations and became extinct and grew again somewhat modified in new locations. Of the many hundred thousands of years the last 200 have seen a human interest to learn about the distribution of plants. Closer observation within the last half century revealed that even plants are not as static as some would have it. As elsewhere so with plants “panta rhei.” Not myth but scholarly research and less martial language is desirable. Borchardt, R. — 1987 (1938), Der leidenschaftliche Gärtner. Nördlingen. Braun-Blanquet, J. — 1983 (1932), Pflanzensoziologie. Königstein. Butenschön, S. and I. Säumel — 2009, “Green Traces from Past to Future: Eco-Cultural Value of Historical Parks in Central Europe”. Presented at the 2nd International Conference on Landscape and Urban Horticulture, Bologna (Italy), 9-13 June 2009. Cassidy, V.M. — 2007, Henry Chandler Cowles, Pioneer Ecologist. Chicago. Cowles, H.C. — 1899, “The Ecological Relations of the Vegetation on the Sand Dunes of Lake Michigan. Part I: Geographical Relations of the Dune Floras”, Botanical Gazette 27 (2): 95-1 17; (3): 167-202; (4): 281-308; (5): 361-391. Darwin, C. — 1859, On the Origin of Species. London. Diboll, N. — 1989, “Wildflowers. The Case for Native Plants”, Flower and Garden. The Home Gardening Magazine 33: 2. Drude, O. — 1894, Führer durch den Königlich Botanischen Garten in Dresden. Dresden. Echtermeyer, T. ed. — 1913, Die Königliche Gärtnerlehranstalt Dahlem (bei Berlin-Steglitz). Denkschrift zur Erinnerung an das zehnjährige Bestehen der Anstalt in Dahlem, 1903-1913. Berlin. Engler, A. — 1886, Führer durch den Königlich Botanischen Garten der Universität zu Breslau. Breslau. — 1899, Entwicklung der Pflanzengeographie in den letzten hundert Jahren. Wissenschaftlicher Beitrag zum Gedächtnis der hundertjährigen Wiederkehr des Antritts von Alexander von Humboldts Reise nach Amerika am 5. Juni 1799. Berlin. Fintelmann, G.A. — 1841, “Die Wildbaumzucht”, in P.J. Lenné et al. eds., Handbibliothek für Gärtner und Liebhaber der Gärtnerei. Fünfte Abtheilung. Berlin. Gothein, M.L. — 1926, Geschichte der Gartenkunst. Jena. Gould, S.J. — 1997, “An Evolutionary Perspective on Strengths, Fallacies, and Confusions in the Concept of Native Plants”, in J. Wolschke-Bulmahn ed., Nature and Ideology. Natural Garden Design in the Twentieth Century. Dumbarton Oaks Colloquium on the History of Landscape Architecture. Vol. XVIII: 11-20. Washington DC. Graebner, P. — 1895, Studien über die Norddeutsche Heiden. Versuch einer Formationsgliederung. Leipzig. Gröning, G. — 1989, “Peter Joseph Lenné und der ’Verein zur Beförderung des Gartenbaues in den Königlich Preußischen Staaten’”, in F. von Buttlar ed., Peter Joseph Lenné, Volkspark und Arkadien. Berlin: 82-90. Gröning, G. and U. Schneider — 2001, Gartenkultur und nationale Identität. Grüne Reihe: Quellen und Forschungen zur Gartenkunst. Volume 19. Worms. Gröning, G. and J. Wolschke-Bulmahn — 1987, “Die Liebe zur Landschaft. Der Drang nach Osten. Zur Entwicklung der Landespflege im Nationalsozialismus und während des Zweiten Weltkrieges in den ’eingegliederten Ostgebieten’. Arbeiten zur sozialwissenschaftlich orientierten Freiraumplanung”. Volume 9. München. — 1992, “Some Notes on the Mania for Native Plants in Germany”, Landscape Journal 1 1 (2): 1 16-126. — 1997, Grüne Biographien. Biographisches Handbuch zur Landschaftsarchitektur des 20. Jahrhunderts in Deutschland. Berlin. Haas, V. — 1982, Kulturgeschichte der antiken Welt. Volume 10: Hethitische Berggötter und hurritische Steindämonen. Mainz. Hackforth, R. — 1972 (1952), Plato’s Phaedrus. Translated with an Introduction and Commentary. Cambridge, UK. Haeckel, E. — 1866a, Generelle Morphologie der Organismen. Erster Band: Allgemeine Anatomie der Organismen. Berlin. — 1866b, Generelle Morphologie der Organismen. Zweiter Band : Allgemeine Entwicklungsgeschichte der Organismen. Berlin. Hennebo, D. — 1955, “Betrachtungen zur altägyptischen Gartenkunst”, Archiv für Gartenbau 3 (3): 175-218. — 1956, “Dendrologische Expedition im frühen Altertum”, Das Gartenamt 5 (6): 110-114. Hoke, G. — 1991, “Herrenkrug. Die Entwicklung eines Magdeburger Landschaftsparkes”. Magistrat der Stadt Magdeburg, Dezernat Umwelt ed. Magdeburg. Hudson, J.R. and S. Calkins — 1993, “Natives vs. Exotics: The Myth of the Menace. Non-Native Species as Allies of Diversity”, The 1993 Ethnobotanical Catalog of Seeds. Redwood City, CA. Hugonot, J.-C. — 1989, Le jardin dans l’Egypte ancienne. Publications universitaires européennes. Série XXXVIII: “Archéologie”. Volume 27. Francfort am Main. Humboldt, A. von and A. Bonpland — 1805, Essai sur la géographie des plantes. Paris. Ickes, H.L. — 1941, Letters to Jens Jensen of February 11, 1941 and February 18, 1941. Jens Jensen Collection. Sterling Morton Library. Lisle, Ill.
Jensen, J. — 1923, “Die Landschaftsgärtnerei. Eine Kunst”, Die Gartenschönheit 4 (4): 68-69. — 1937, ”Die ’Lichtung’”, Die Gartenkunst 50 (9): 177-181. — 1939, Letter of April 15, 1939, to Camillo Schneider. Jens Jensen Collection. Sterling Morton Library. Lisle, Ill. — 1940-1941, Jens Jensen Toughts (sic). A Letter to a Friend in Germany, 17-18. Jens Jensen Collection. Sterling Morton Library. Lisle, Ill. — 1990 (1939), Siftings. Chicago/Baltimore. Jordan III, W.R. — 1994, “The Nazi Connection”, Restoration and Management Notes: 113-114. Kahn, L. — 1995, Hadrian’s Villa and Its Legacy. New Haven, Conn.
Keimer, L. — 1924, Die Gartenpflanzen im alten Ägypten. Berlin. Koller, G. — 1992, “Native Dictates”, Arnoldia 52 (4): 23-33. Krämer, A. — 1936, “Pflanzensoziologie und der Blut- und Bodenverbundene Garten”, Die Gartenkunst 49 (3): 40-43. Lange, W. — 1900, “Garten und Weltanschauung”, Gartenwelt 4 (31): 361-364. — 1907, Gartengestaltung der Neuzeit. Leipzig. — 1912, Gartengestaltung der Neuzeit. Leipzig. — 1913, Der Garten und seine Bepflanzung. Stuttgart. — 1928, Gartengestaltung der Neuzeit. Leipzig. Leland, J. — 2005, Aliens in the Backyard. Plant and Animal Imports into America. Columbia, South Carolina. Mangin, A. — 1883, Histoire des jardins chez tous les peuples depuis l’Antiquité jusqu’à nos jours. Tours. Miller, W. — 1915, “The Prairie Style of Landscape Gardening”. College of Agriculture, University of Illinois, Urbana. Murray, A.T. — 1931, Homer The Odyssey. London. North, E. — 1858, “Greek Ideals of Gardening”, The Horticulturist XII: 299-304. Parkinson, J. — 1629, Paradisi in sole Paradisus Terrestris. London. Potonie, H. — 1890, Ansicht der Alpenpartie der Englerschen pflanzengeographischen Anlage im Kgl. Botanischen Garten zu Berlin. Berlin. Rehmann, E. — 1933, “An Ecological Approach”, Landscape Architecture Magazine 23 (4): 239-246. Rikli, M. and E. Rubel — 1928, “Das Niltal in Ägypten und Nubien”, in G. Karsten ed., Vegetationsbilder, 19. Reihe, Heft 3/4, tab. 13-24. Jena. Sauer, L. — 1993, “The North Woods of Central Park”, Landscape Architecture 93 (3): 55-57. Schneider, C. — 1939, Letter of 29 October 1939 to Jens Jensen. Jens Jensen Collection. Sterling Morton Library. Lisle, Ill.
Seifert, A. — 1930a, “Bodenständige Gartenkunst”, Die Gartenkunst 43 (10): 162-164. — 1930b, “Randbemerkungen zum Aufsatz ’Von bodenständiger Gartenkunst’”, Die Gartenkunst 43 (10): 166. — 1937, Natur und Technik im deutschen Straßenbau”, Naturschutz 18 (11): 229-232. Sorvig, K. — 1993, “Natives and Nazis: An Imaginary Conspiracy in Ecological Design”, Landscape Journal 13 (2): 194. Stauffer, R.C. — 1957, “Haeckel, Darwin, and Ecology”, The Quarterly Review of Biology 32 (2): 138144. Theodoropoulos, D.I. — 2003, Invasion Biology. Critique of a Pseudoscience. Blythe, California. Warming, E. — 1895, Plantesamfund, grund traek af den oekologiske plantegeografi. Kabenhavn. — 1896, Lehrbuch der ökologischen Pflanzengeographie. Berlin. — 1909, Oecology of Plants. Oxford. Waugh, F.A. — 1917, The Natural Style in Landscape Gardening. Boston. Wiepking-Jürgensmann, H.F. — 1942, Die Landschaftsfibel. Berlin. Wilkinson, A. — 1990, “Gardens in Ancient Egypt: Their Locations and Symbolism”, Journal of .Garden History 10 (4): 199-208. — 2001, “Egypt: Ancient”, in C.A. Shoemaker ed., Chicago Botanic Garden Encyclopedia of Gardens. Vol. 1: History and Design: 417419. Witt, R. — 1986, “Reißt die Rhododendron raus!”, Kosmos 5: 70-75. Wolschke-Bulmahn, J. — 1994, “’The Peculiar Garden’. The Advent and the Destruction of Modernism in German Garden Design”. Masters of American Garden Design. Volume III: 17-30, Cold Spring N.Y. — 1997, “Avantgarde und Gartenarchitektur in Deutschland”, Zolltexte 26: 11-17. See J. Leland . The chapter “Misplaced Americans” has this as subline. Meaning “everything flows” in Greek. See A. Mangin . The book shows three related etchings: “Jardin d’un temple égyptien,” “Villa égyptienne,” and “Un oasis du Sahara.” See also M.L. Gothein . See a much later visualization of the “Jardin d’Alci-nous” in an etching in A. Mangin [1883: 48]. See Statuten für den Verein zur Beförderung des Gartenbaues im Preußischen Staate, 1824, Berlin, p. 7. See the attached plan for the garden with the plant-geographical groups in A. Engler . The heath had been arranged in front of the prealpine and alpine formations. As with the alpine formations it was the intention to present a selection of the most important character plants and to create a picture of a heath formation. See table II in H. Potonie . See chapters VIII A: “Chemischer Character des Pflanzenreiches”, VIII B: “Morphologischer Character des Pflanzenreiches” and VIII C: “Physiologischer Character des Pflanzenreiches” in Haeckel’s book [1866a]. See Kuratorium der Gärtnerlehranstalt, “Die königliche Gärtner-Lehranstalt zu Dahlem bei Steglitz,” Die Gartenkunst 5 (10), pp. 177-179, 1903. Nevertheless, it has to be mentioned that Lange and other landscape architects who promoted ideas about natural garden design, created formal gardens also and often used foreign plants. In particular Lange recommended foreign plants, which he believed matched the native plant associations physiognomically, and which would highten the artistic effect of native plant associations. Gert Gröning et Joachim Wolschke-Bulmahn, « THE MYTH OF PLANT-INVADED GARDENS AND LANDSCAPES », Études rurales, 185 | 2010, 197-218.